ANTI-TAKEOVER PROVISIONS The data in this section was sourced from SharkRepellent.net for the Top 100 Companies Shearman & Sterling LLP Anti-Takeover Provisions | 79 ANTI-TAKEOVER PROVISIONS Although "poison pills" are often considered the most visible anti- takeover defense, only a small minority of companies have actually adopted such policies. 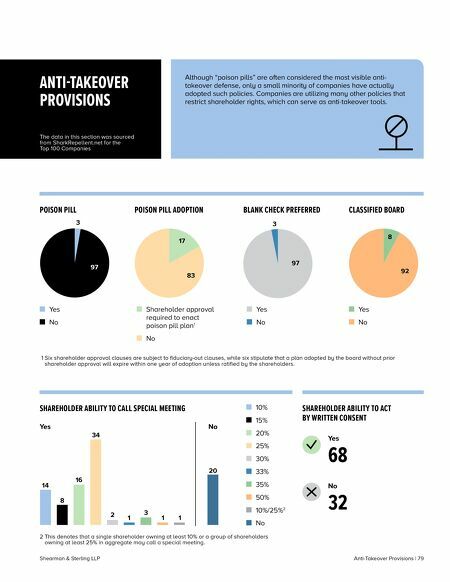 Companies are utilizing many other policies that restrict shareholder rights, which can serve as anti-takeover tools. 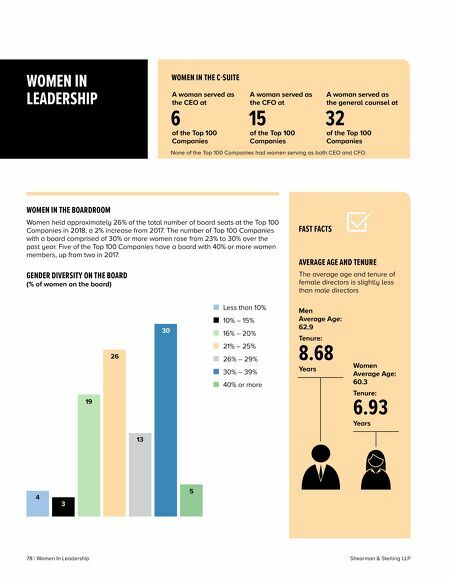 The data in this section was sourced from SharkRepellent.net for the Top 100 Companies Yes 68 No 32 POISON PILL Yes No SHAREHOLDER ABILITY TO CALL SPECIAL MEETING SHAREHOLDER ABILITY TO ACT BY WRITTEN CONSENT POISON PILL ADOPTION BLANK CHECK PREFERRED CLASSIFIED BOARD 3 97 17 83 92 8 97 3 Yes No Shareholder approval required to enact poison pill plan 1 No Yes No Yes No 8 16 34 2 1 3 1 1 20 14 10% 15% 20% 25% 30% 33% 35% 50% 10%/25% 2 No 1 Six shareholder approval clauses are subject to fiduciary-out clauses, while six stipulate that a plan adopted by the board without prior shareholder approval will expire within one year of adoption unless ratified by the shareholders. 2 This denotes that a single shareholder owning at least 10% or a group of shareholders owning at least 25% in aggregate may call a special meeting.